Beyond Fandom: Vampire Diaries 4.02 Review - "Memorial"
Only two episodes into this season of The Vampire Diaries and it’s pretty clear what the running theme is going to be. If we had just listened to Damon in the first place, then things wouldn’t have been as hard as they are now. That says a lot considering for the longest time Damon was the captain of bad ideas which included hiding the moonstone in his soapdish. The struggle between Damon and Stefan over how best to rear Elena as a baby vampire is very very tedious. We’ve both seen how they’ve been as younger vampires and older vampires. Damon was a milder younger vampire who did indulge in blood he’s far more nonplussed about killing a human here and there now. 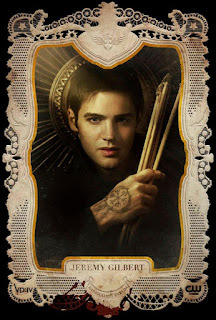 On the other hand Stefan was a crazy ripper for much of his younger vampire-hood, but he is far more sympathetic to human life now at least when he doesn’t have a horrific relapse of course. In the end the brothers need to accept that Elena is her own woman who shouldn’t be coddled which is something that Caroline proves later in the episode when she tells Elena that she won’t know how to compel someone unless she learns it herself. I’m clinging to every thread of hope that Elena will not just buckle and become the kind of girl who simply clings to whichever Salvatore is closest so they can fight her battles for her, which is why I really didn’t like season three Elena. What happened to the girl who stabbed herself in order to fool Elijah back in season two, and the girl who fought off a rabid Rose? Somewhere along the way she lost all the fight in her and I’m desperately hoping she gets it back. For the first chunk of the episode that consisted of the brothers arguing about what’s best for Elena and the Twilight-esque romp through the forest I was hoping my TV would go out so I’d have an excuse to do something else. Then we came to the end of the episode where the team once again gathers to pay tribute to those they’ve lost. I’m honestly getting a bit tired of the ‘pity me for I am dead’ parties that the newly-turned vampires love to throw for themselves. 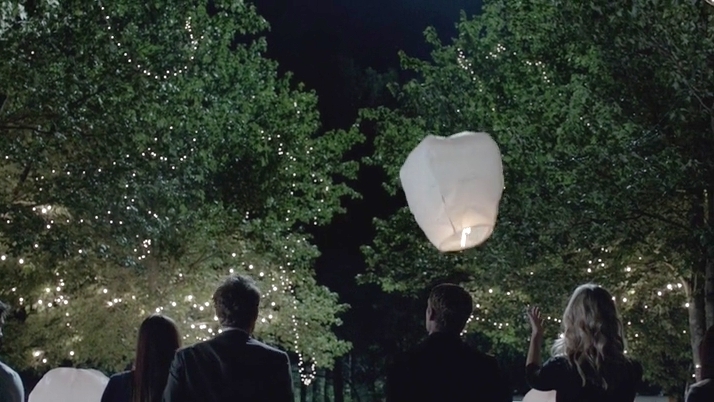 If we have another mourning session over Elena this season I might throw an object at my TV. Or just storm off like Damon did. Which leads to what was my favorite part of the episode and season so far. After the Japanese lantern memorial (I agreed with Damon on the subject: ‘newsflash, we’re not Japanese’) we see Damon seemingly talking to himself while having a drink. 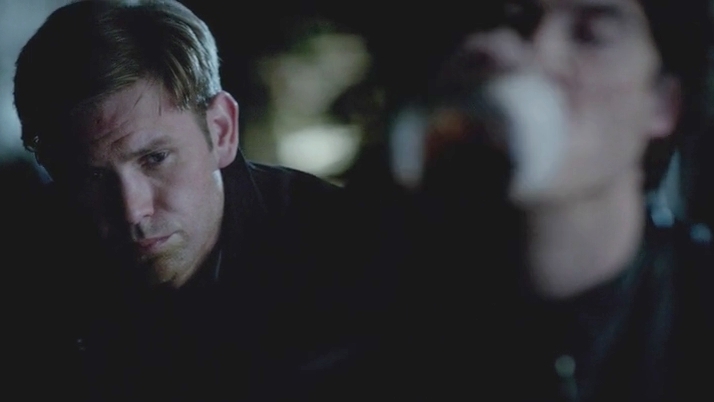 It didn’t take long to realize he was talking to Alaric’s grave. The real treat of the episode came when we see that, unbeknownst to Damon, Alaric’s ghost is listening to the conversation. I have to wonder if he’ll be paying Jeremy a visit as it seems the larger arc of this season is going to revolve around hunters and the legacy behind them. But beyond that something about this scene brought a tear to my eye. I’m not sure if it was how this scene struck a fond memory of what kind of show The Vampire Diaries used to be for me, or if maybe I missed the friendship that was Damon and Alaric. Speaking of Hunters, we met Connor this week and I assumed they were going to deal with him as quickly as they dealt with the pastor last week. As Keysha said in her review of the season opener, I too have a hard time taking any threats on the show seriously anymore. I think the spelled bullets are interesting, as is his willingness to have collateral damage, but we’ll see if his threat carries through the season. 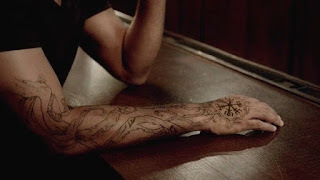 The big twist was that near the end of the episode Jeremy was able to see a phantom tattoo on Connor’s arm (the same one he himself is sporting in some promo art). In the end I found most of this episode of The Vampire Diaries to be a bit tedious, maybe I was missing the very absent Klaus and Rebekah. 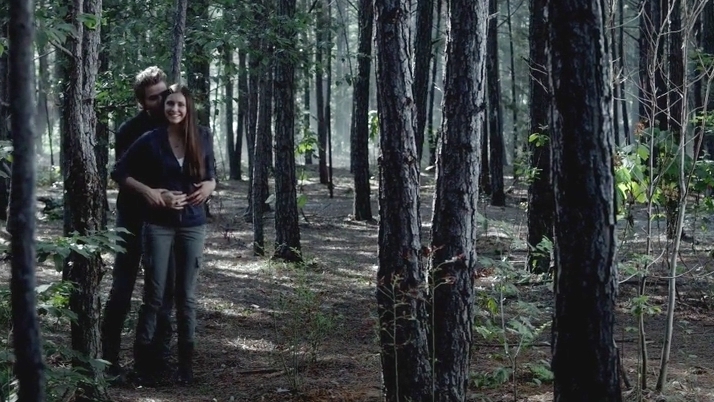 But more likely I’m just sick to death of Elena being coddled. It was nice to see Matt Davis again however.